Most people I know in business have a Blackberry. And it is usually a Blackberry, not another smartphone brand, that people use to keep on top of things like email when theyâ€™re out and about. For years, Iâ€™ve been a permanent resistor to the notion of being at the beck and call of email no matter where you are, and no matter when you are. Thatâ€™s how Iâ€™ve always looked at it â€“ the mobile email monster craves your attention 24/7. Yet Iâ€™ve come to accept a certain reality in business, which is that you canâ€™t really afford to be disconnected when youâ€™re mobile. So Iâ€™m going to experiment with such a smartphone over the next few weeks. But itâ€™s not a Blackberry. 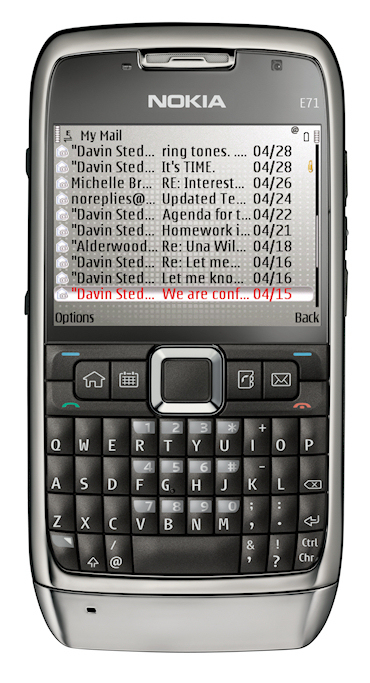 Instead, thanks to the folks at WOM World/Nokia, Iâ€™ll be using a Nokia E71, the mobile device from Nokia you see pictured here (click the image for a larger view) that was launched in June, and which I think is the prime competitor to Blackberry, notably the Blackberry Bold. Unlike other mobile devices from 3 and O2 Iâ€™ve been testing in recent months, where the devices come ready-to-go with SIM cards and accounts, Iâ€™ll be using the E71 on my own dime, so to speak. So Iâ€™ll slip my Vodafone SIM card into it and configure it for my own email, etc. That means Iâ€™ll be largely forsaking my Nokia N95 8GB while I use the E71. Not sure how Iâ€™ll manage â€“ and how soon the withdrawal symptoms will start â€“ in switching a superb multimedia device to a business-focused one. And will it persuade me to change my views about the mobile email monster? Weâ€™ll see. Review to come on Next, my tech blog.